Morphasis Vase, an experiment in the wire-frame style that took some patience to get working. Just imagine for a moment the precision required to push a pencil tip back and forth on a desk for 24 hours between the exact same 3 points. This is what a 3D printer has to do, in terms of precision. If it gets off track even a 1/10 of a millimeter, there will be a visible artifact / deviation in the line that gets drawn. To keep machine price tags down in the home 3D printer market, many high precision parts have to be swapped out for medium precision alternatives. So what you end up unboxing at home is a 3D printer that works as expected most of the time. But this expected range does include a bit of imprecision. This is why many 3D printer owners end up hacking and improving the machines they own by replacing cheaper parts with better ones. I have yet to do this, but I have had to make small repairs to failing parts of each of my 3D printers from time to time. These truths are not necessarily negative, but they are the gritty details of what challenges a new user may have to face. I really enjoy learning, tinkering and figuring things out. But I know some people like to avoid this. The trend for home electronics has been plug-n-play. Although 3D printers can be plug-n-play for a few months of use, there will be a time when they need to be fixed or maintained. At that point, the plug-n-play aspect kind of vanishes. A MakerBot Replicator 2 making the Extra Blissful Vase. In this picture we are about 6 hours into a 24 hour print process! Some users experience a difficult unboxing experience: parts shifted in the shipping process. The 3D printer needs adjustments and repairs when it is first unpacked. This seems more common with smaller 3D printer manufactures with less experience packing for transit. Current 3D printers require maintenance and occasional tinkering to keep them in optimal condition. Rods need oil, Build platforms need to be cleaned and leveled. Some filaments need to be dried out with desiccant if they have absorbed too much moisture from the air. Slicing software that is used to turn 3D models into coded instructions for 3D printers takes time learn and master. Models with a lot of overhanging shapes or thin walls will require more set-up than default settings. Optimal slicing settings can vary greatly from one brand of printer to another. Most replacement parts like rods, bearing, belts, and motors have to be special ordered unless there is a robotics hobby shop in the area. And the process of fixing or installing parts in the 3D printer is not always well documented. Optical Sphere Coaster, pushing the limits of thin mesh segments. Plastic filaments from various manufactures have different melting temperatures. This means that on top of everything else, there can be additional time and prototyping needed to find the best temperature to use. And this ideal temp can change from one printer to another and can also vary by color and the ambient temperature of the room. A field journal is mandatory! Even with all the potential issues and uncertain variables, the possibilities of 3D printing far outweigh the challenges. You can create art, inventions, jewelry, and toys to name just a few uses. The plastic parts are strong enough to use in lower impact mechanical situations. Vessels can hold water and planters can hold dirt. Toys can have articulated parts and really . . . once you get creating the possibilities are endless. 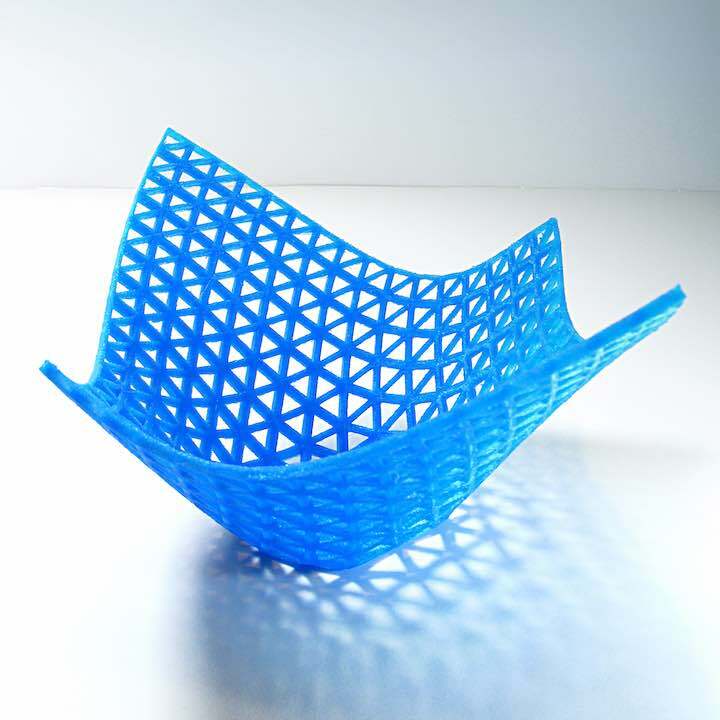 Mesh Basket, this 3D model was produced in about 2 minutes with a dynamic cloth simulation. I do not assume that 3D printers will be as widely adopted as things like the home computer or dish-washer. I feel that 3D printers are specialized creative tools, much like industrial sewing machines, table saws or Adobe Photoshop. These tools all require sufficient specialized skills to use them properly. And I feel that this is good for the end user. A 3D printer out to please everyone is not going to have quick access to the features that advanced users will need. I have already run into this issue with the UP Plus 2. It allows you to get printing quickly because there are very few settings. But once you get past a certain stage, it feels very limiting. 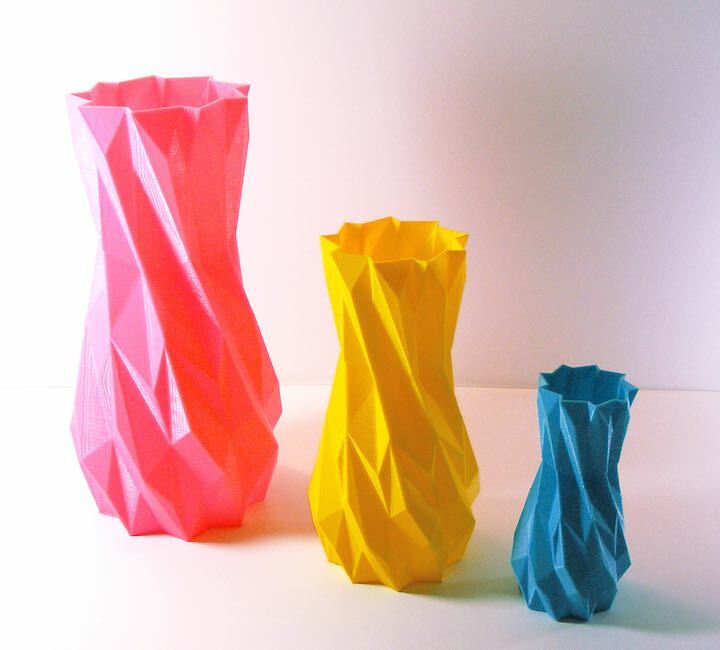 EleMental Polygon Vases, designed to be reproduced in my studio at any size needed. So my vision of the future of 3D printing is one where various new markets have emerged by the help of those who have pushed their techniques into a business. There could be people who only make replacement parts for worn out goods. And other business that focus on art, or others that focus on toys. The leaders of this revolution are those who learn how to wrangle and harness the power of the technology itself. Then they are free to peruse their own creative vision by creating it themselves. Being unhinged from the manufacturing process of the past is truly liberating. I am personally very excited to be involved and can’t wait to see how the technology grows. But most of all I am just plain excited to create new objects right out of thin air. 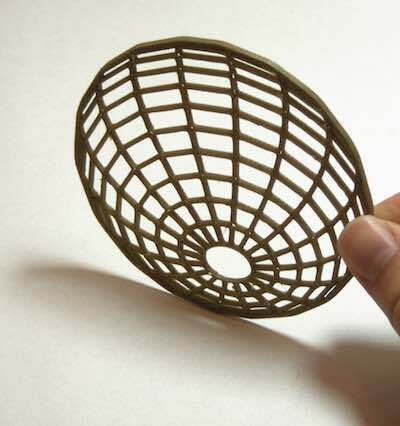 At the age of 11, Noah Hornberger created his first 3D model. 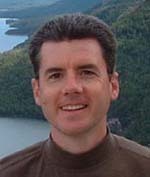 A native of Howell, Michigan, he studied art, music, and animation at the School of the Art Institute of Chicago. 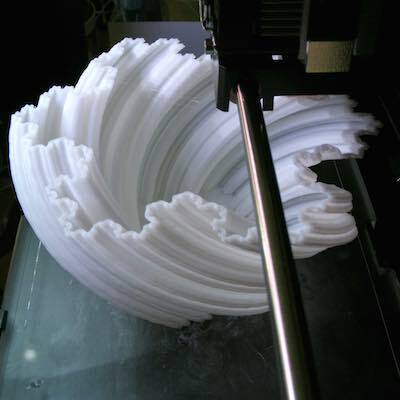 Today is pioneering 3D printing technology to create pop art, decor, toys, and other fun prototypes. You did some really nice objects! I quite love the Morphasis Vase. I’ve seen in a expo a 3d scanner which allows you to scan any object you see and reproduce it! I personaly bought a little Â£250 3d printer on the website you see. Unfortunately I’m limited in the size of the products I can do. its awesome design and awesome site. Love your artwork! I would be terrified of starting a 24 hour print, I once ran out of filament 90% through a 10 hour print!. I am curious if copy-catting a problem for you though. With the price of this special equipment coming down and seeing what kind of prices you able to sell for, I would imagine competition could become a significant problem. will be unable to use it at its full potential. But is very convenient for every household to have access to a 3d printer because every man has its own sense of comfort and they can make that comfort possible without searching too much through shops. 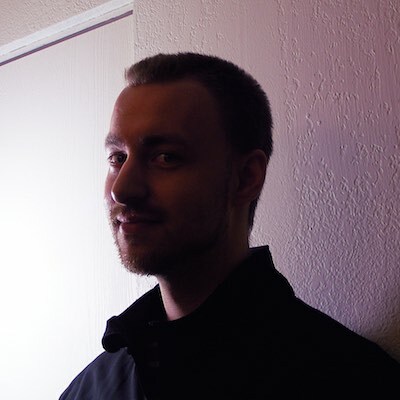 I do hope that in the future, when the 3d printer will be adopted by much more people, there will be services or specialized people that can deal with the potential problems the 3d printer components will have because as u said yourself not everyone enjoys tinkering with the components of the printer. I’m also hopping 3D printing continues to evolve. 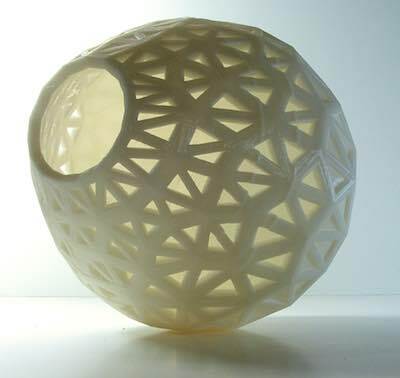 It would be incredible to just have to buy a few raw materials to print whatever decoration we need at home. Maybe one day everyone will have his own 3D printer at home. I saw one on a expo I saw last month and I think that is very innovative and I heard that they want to implement 3D printers in medicine also , let’s see what is their future ! Hi, you are a realy geat man. I like this your 3D Printing. I can not believe my eyes. very very nice ‘3D Printing’. I’m also hoping ‘3D printing’ continues to evolve and next post published as early.I am also waiting now. 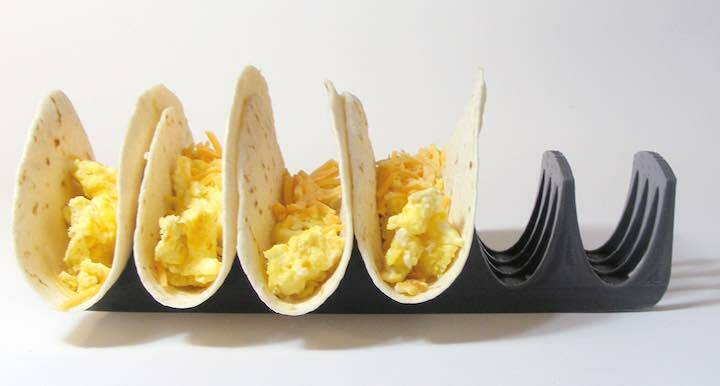 I love your taco shell holder. What type of material is it made out of? It would be awesome to have one that you can put in the oven or on a hot grill. 3d printing is hands down an incredibly technology. However, I totally believe the consumer side of things have slowed down (Especially with the recent selling of https://pinshape.com/3d-marketplace). Good news is that the commercial aspect of this industry (Nasa space shuttle parts, Google glasses, etc) is sky rocketing. Now there are multiple applications and now even the commercial printers are on a whole another level. We are not just limited by filaments anymore. I believe the folks at Formlabs just came with a ‘tough’ resin ( http://formlabs.com/support/materials/using-tough-resin/ ) that is used my some massive construction and engineering companies. 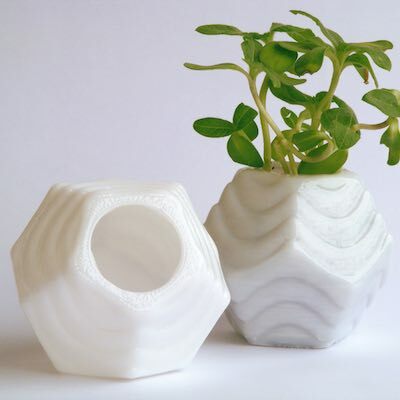 The future looks bright for 3d printing but it just hasn’t reached the mainstream just yet. At least in my opinion. I would say give it 10 more years for a ‘consumer level’ breakthrough.